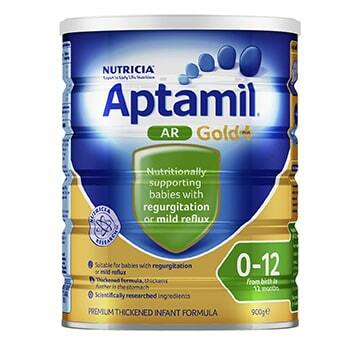 Aptamil® Gold+ AR is a premium infant formula for babies from birth to 12 months. It is suitable for babies with regurgitation or mild reflux and may help reduce the severity and frequency of regurgitation episodes. Aptamil Gold+ AR Infant Formula is not suitable for general use and should be used under medical supervision. It is not to be used for infants with a diagnosed cows' milk protein allergy. Suitable For: Babies from birth to 12 months with regurgitation or mild reflux. Breast milk is best for babies. Before you decide to use this product, consult your doctor or health worker for advice. Dental Hygiene: Putting your baby to bed with a bottle can cause tooth decay. Encourage your baby to drink from a cup from 6-8 months. Milk solids, vegetable oils [contains soy oil, antioxidant (ascorbyl palmitate, citric acid)], maltodextrin, thickener (carob bean gum), L-cysteine, emulsifier (soy lecithin), taurine, choline chloride, carnitine. Vitamins: Vitamins (A, B1, B3, B5, B6, B12, C, D, E, K1), folic acid, biotin. Aptamil AR Thickened Infant Formula From Birth 0-12 Months 900g is rated 5.0 out of 5 by 10. Rated 5 out of 5 by Danni17 from Excellent products. 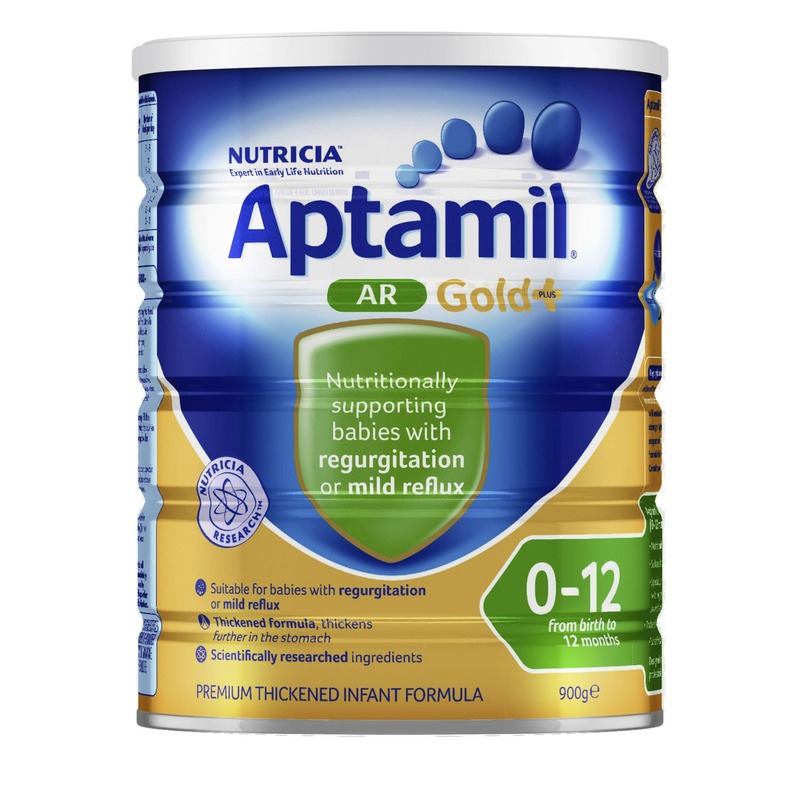 I bought 2 tins of aptamil gold ar online for my newborn due to him having reflux and it is one of the best formulas to minimise the reflux. It is easy to find on the website and it is always at an amazing low price, i wouldn't change his formula to anything else. Thankyou. Rated 5 out of 5 by Ashley P from Happy Baby, Happy Mum! My son had suspected reflux, because he was bringing up all my milk and then I had to try formula. Regular Formula wasn't agreeing and he was still quite sick so I moved onto Aptamil AR. The formula is thick from the beginning, which is great. My son absolutely loves it and hasn't been sick again in the slightest. He's thriving and completely settled. It hasn't given him any issues with constipation or colic either which was my concern. He still goes to the toilet regularly and sleeps for long stretches and is just a dream. Aptamil AR has been a life saver and would highly recommend for any little ones suffering with reflux. Definitely worth it!